Welcome Hope you are having a good time. Protect corporate information from: theft, corruption, or unauthorized access Comply with internal IT standards Comply with Sarbanes-Oxley (SOX) audits Why are you here today? Most likely you are an admin and security is one of your most important job responsibilities. SOX topics are very prevalent at this year’s conference. 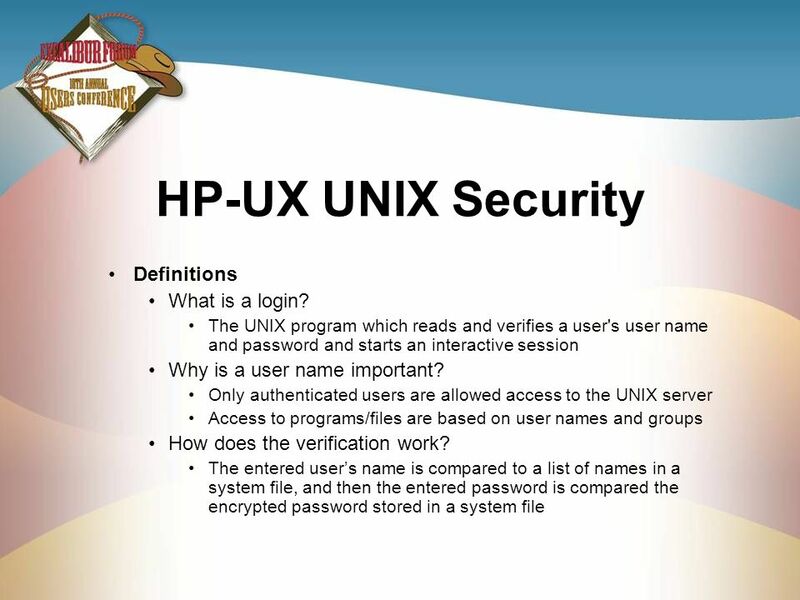 8 HP-UX UNIX Security Definitions What is a login? root:/.57wLPQp2cV6:0:3::/:/sbin/ksh rootlike:/.57wLPQp2cV6:0:3::/:/sbin/ksh daemon:*:1:5::/:/sbin/sh bin:*:2:2::/usr/bin:/sbin/sh sys:*:3:3::/: adm:*:4:4::/var/adm:/sbin/sh uucp:*:5:3::/var/spool/uucppublic:/usr/lbin/uucp/uucico Here is an example listing of the /etc/passwd file 1st 15 entries are OS related and created when the OS is loaded/ignited by HP before delivery to client Go over root field by field. Ask about /sbin/ksh as shell. Why not /usr/bin/ksh? /usr not mounted when system starts up, wouldn’t be able to find it Ask about rootlike? What is it? Why is it bad? Why is it good? nuucp:*:11:11::/var/spool/uucppublic:/usr/lbin/uucp/uucico hpdb:*:27:1:ALLBASE:/:/sbin/sh nobody:*:-2:-2::/: www:*:30:1::/: webadmin:*:40:1::/usr/obam/server/nologindir:/usr/bin/false smbnull:*:101:101:DO NOT USE OR DELETE - needed by Samba:/home/smbnull:/sbin/sh opc_op:*:777:77:OpC default operator:/home/opc_op:/usr/bin/ksh unidata:CuRdujgUu53qA:200:200:,,,:/home/unidata:/usr/bin/ksh Here the rest of the OS ids. Point out webadmin id. 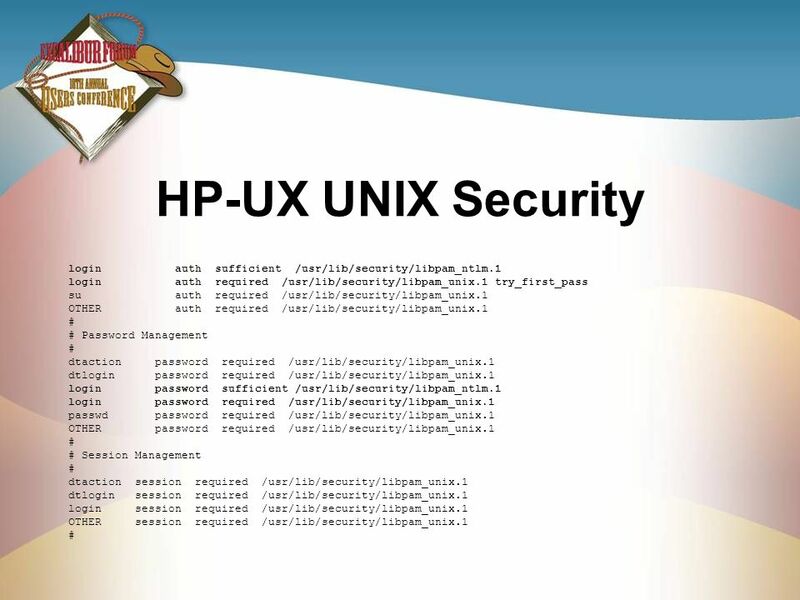 Shell is /usr/bin/false means that it can’t be used to login to system Point out unidata user. State that it is on everyone’s server, P2 uses it for login access to client’s system. Point out unidata group, 200. 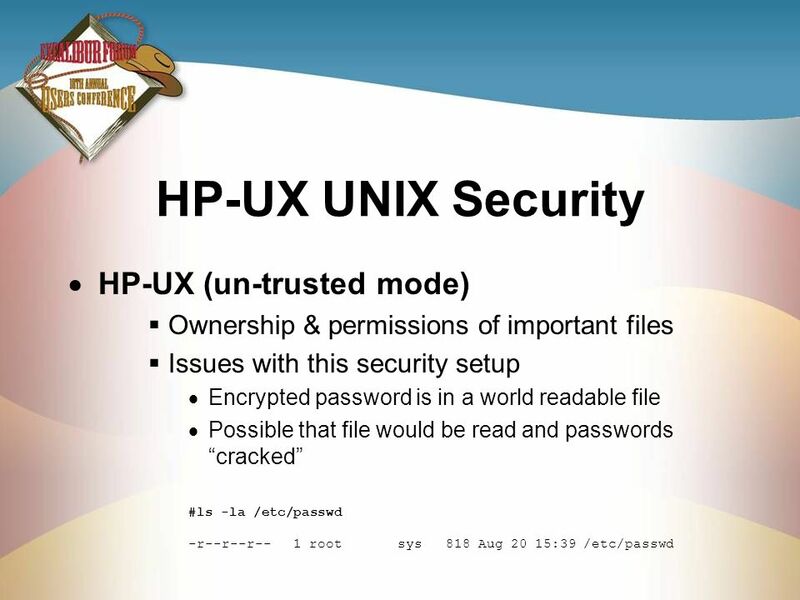 Ownership & permissions of important files Issues with this security setup Encrypted password is in a world readable file Possible that file would be read and passwords “cracked” #ls -la /etc/passwd -r--r--r root sys Aug 20 15:39 /etc/passwd Now that we have a little background on userids and the /etc/passwd file, we can examine the issues with an un-trusted system. Ownership and permissions on /etc/passwd file is the biggest issue that IT auditors have with an un-trusted system. Show that world has read on the file. 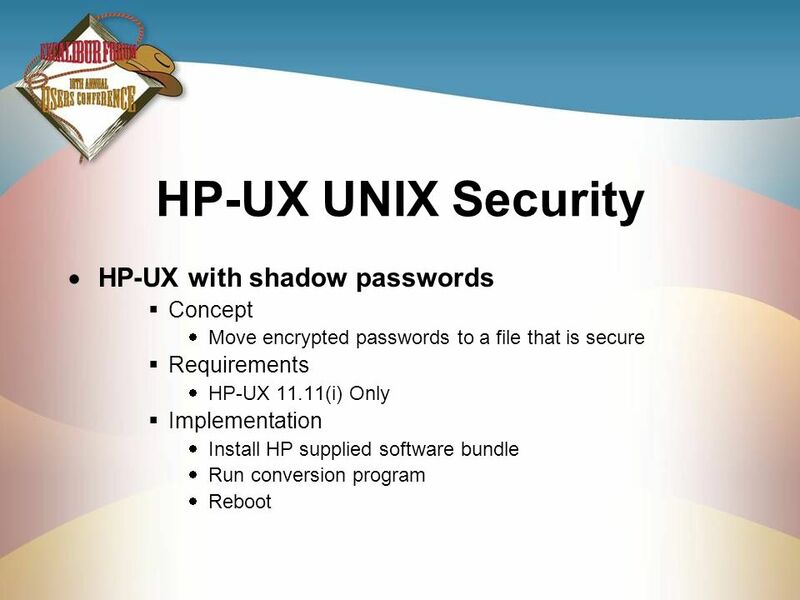 Move encrypted passwords to a file that is secure Requirements HP-UX 11.11(i) Only Implementation Install HP supplied software bundle Run conversion program Reboot New term – shadow passwords Issues? Compatibility, can programs that access /etc/passwd function properly. 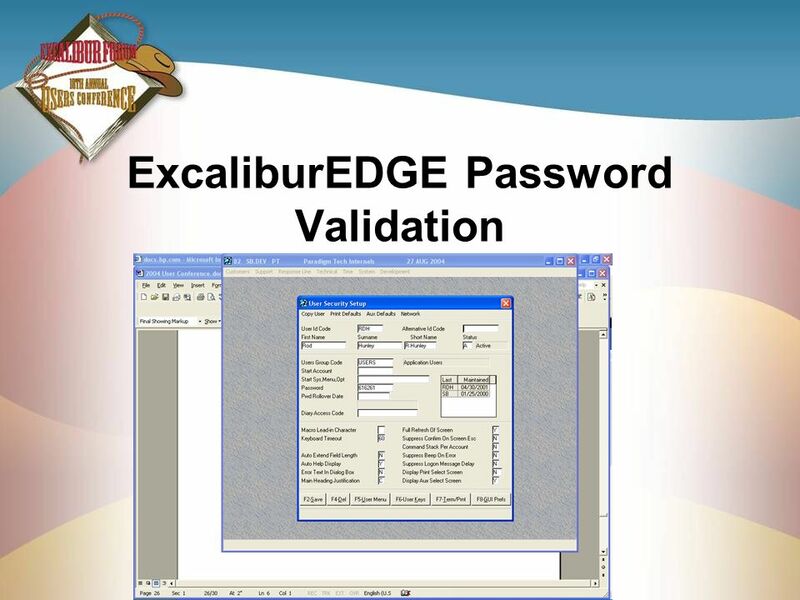 Leave /etc/password structure in place but move the file with encrypted passwords to another location. 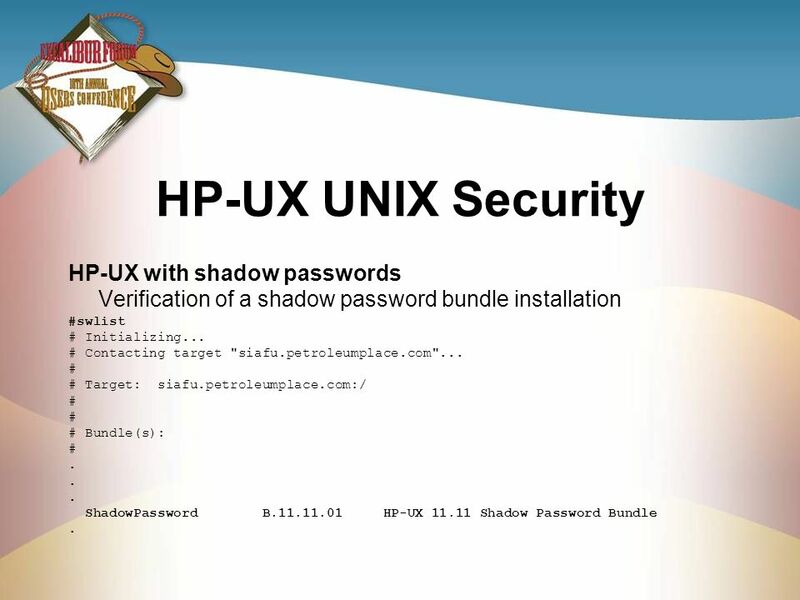 Verification of a shadow password bundle installation #swlist # Initializing... # Contacting target "siafu.petroleumplace.com"... # # Target: siafu.petroleumplace.com:/ # Bundle(s): . 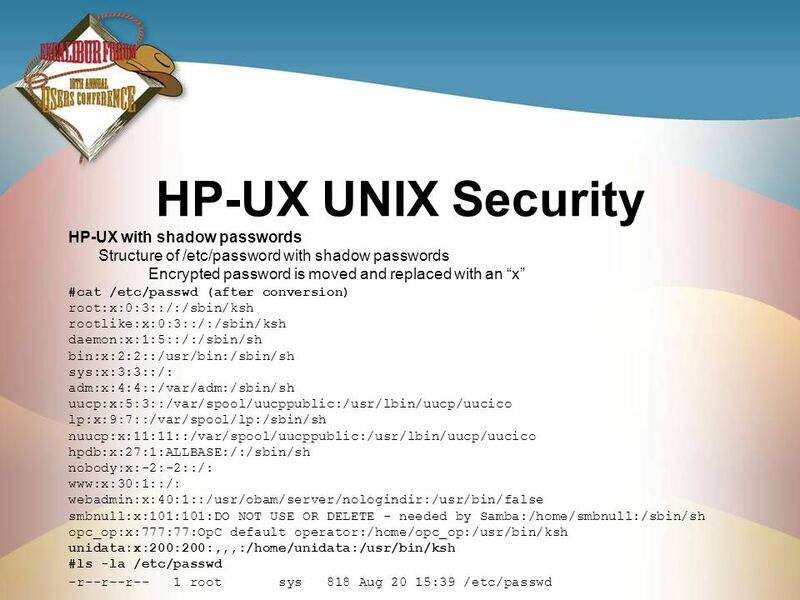 ShadowPassword B HP-UX Shadow Password Bundle How would you know if your server had shadow passwords enabled? Do a swlist as root, look for the Bundle. 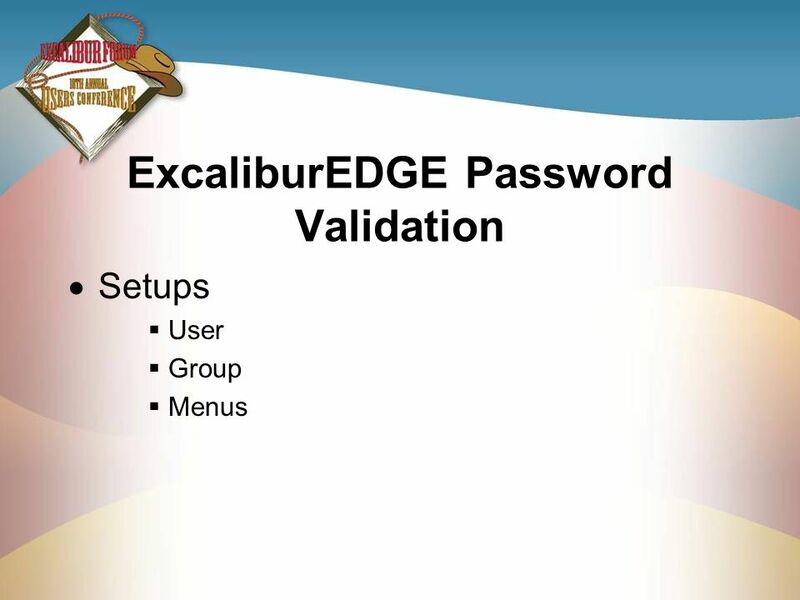 Structure of /etc/password with shadow passwords Encrypted password is moved and replaced with an “x” #cat /etc/passwd (after conversion) root:x:0:3::/:/sbin/ksh rootlike:x:0:3::/:/sbin/ksh daemon:x:1:5::/:/sbin/sh bin:x:2:2::/usr/bin:/sbin/sh sys:x:3:3::/: adm:x:4:4::/var/adm:/sbin/sh uucp:x:5:3::/var/spool/uucppublic:/usr/lbin/uucp/uucico lp:x:9:7::/var/spool/lp:/sbin/sh nuucp:x:11:11::/var/spool/uucppublic:/usr/lbin/uucp/uucico hpdb:x:27:1:ALLBASE:/:/sbin/sh nobody:x:-2:-2::/: www:x:30:1::/: webadmin:x:40:1::/usr/obam/server/nologindir:/usr/bin/false smbnull:x:101:101:DO NOT USE OR DELETE - needed by Samba:/home/smbnull:/sbin/sh opc_op:x:777:77:OpC default operator:/home/opc_op:/usr/bin/ksh unidata:x:200:200:,,,:/home/unidata:/usr/bin/ksh #ls -la /etc/passwd -r--r--r root sys Aug 20 15:39 /etc/passwd Here is an example of a system with SHADOW passwords enabled. Notice that the encrypted password has been replaced by an “x”. Everything else is the same. Same ownerships and permissions as un-trusted. 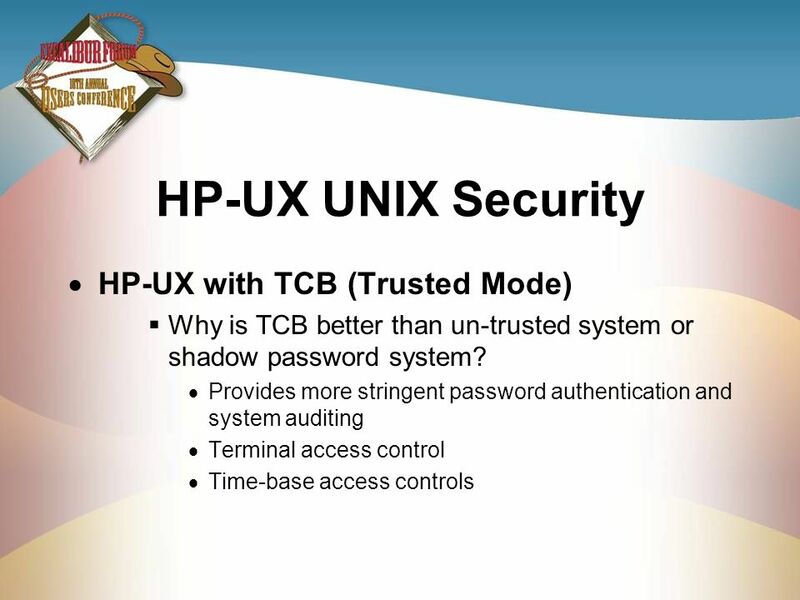 18 HP-UX UNIX Security HP-UX with TCB (Trusted Mode) What is TCB? total 8 drwxrwx root sys Aug 20 21:30 . drwxrwx--x 55 root sys Apr 29 13:36 .. -rw-rw-r root root Aug 20 21:30 unidata -rw-rw-r root root Apr 29 13:36 ursetta -rw-rw-r root root Apr 29 13:36 uucp #cat unidata unidata:u_name=unidata:u_id#204:\ :u_pwd=P36658YzF7/z6:\ :u_auditid#22:\ :u_auditflag#1:\ :u_pswduser=unidata:u_suclog# :u_unsuclog# :u_unsuctty=pts/ta:\ We are headed to the location where the unidata user id is located. Notice that each user is a file. There is a general security policy for all users in effect. These are the items that are unique for each user. Notice the user id 204 and encrypted password are just a couple of the more important items Man of prpwd will show all of the possible options. 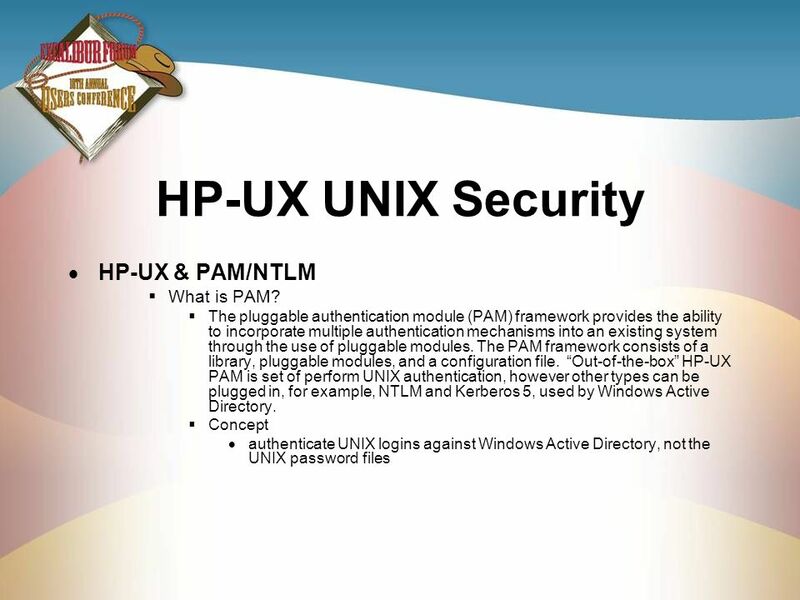 24 HP-UX UNIX Security HP-UX & PAM/NTLM What is PAM? 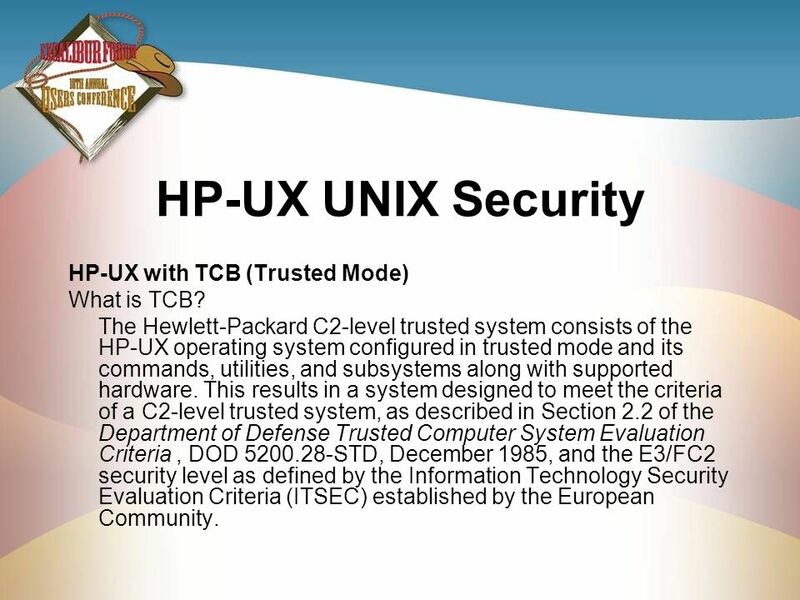 25 HP-UX UNIX Security HP-UX & PAM/NTLM What are the prerequisites? 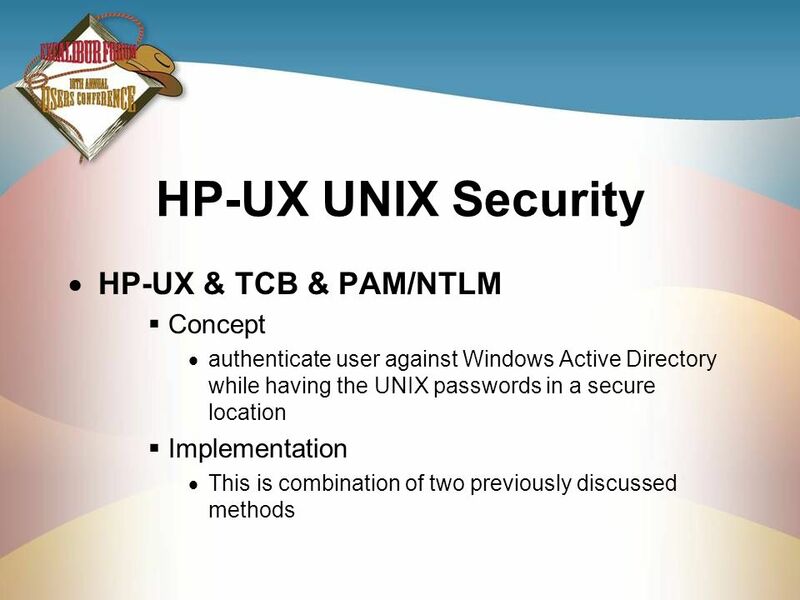 authenticate user against Windows Active Directory while having the UNIX passwords in a secure location Implementation This is combination of two previously discussed methods Here we have the granddaddy of them all. 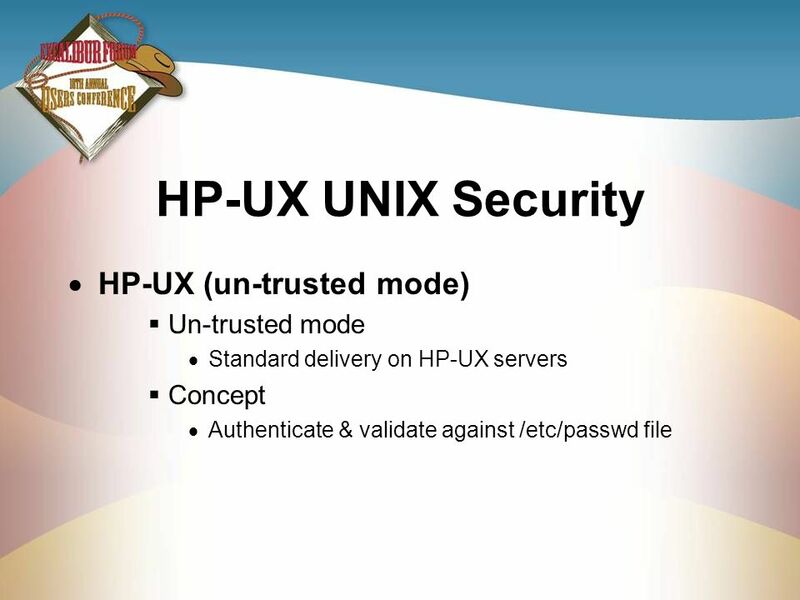 Concept Implementation – This is a combo of the most secure UNIX password scheme and using a single point of password maintenance What is advantages? Secure, complex What is disadvantage? Complex, might be overkill, still have to maintain UNIX users and passwords Compatibility an issue? ftp will use PAM authentication. UniODBC is a problem. It doesn’t use PAM authentication, it still only uses the Unix password. SAMBA What is it? Samba is an Open Source/Free Software suite that provides seamless file and print services to SMB/CIFS clients. Samba is software that can be run on a platform other than Microsoft Windows that allows the host to interact with a Microsoft Windows client or server as if it is a Windows file and print server. 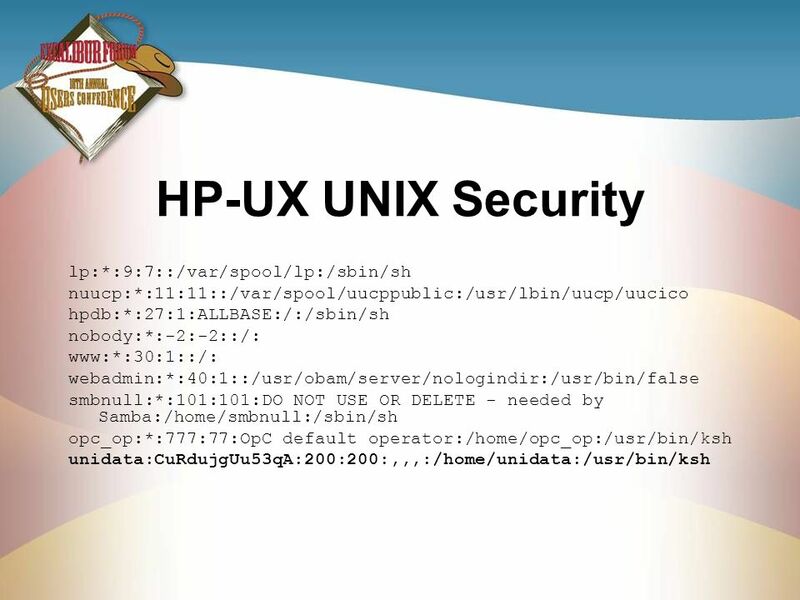 Now we are starting the 2nd Major Topic of this forum, UNIX File Sharing What is Samba? Yes, it is a dance. Open source software that allows interaction between non-Windows platform and Windows. Runs in client and server mode. CIFS/9000 Configuration smb.conf man smb.conf HP-UX server joins the Domain man smbpasswd Use PCs use Windows Explorer to map drives to shares on UNIX server How do we configure this thing? The man pages for smb.conf gives you more than you everything you could possibly need to know. STS will assist. There is a HP-UX kernel parameter that is very important to allow CIFS/9000 to properly join or stay connected to the Windows AD. Windows Sysadmin has to setup a Domain machine account on the AD. Then HP admin has to join the Windows AD with smbpasswd command We have already talked about the uses. Setups User Group Menus Now we are at the 3rd and last topic for this forum. EDGE runs on the SB+ development platform and has its own internal security setups. Will discuss user and group, menus will not be covered. Menu access is very specific and must be carefully designed and implemented. 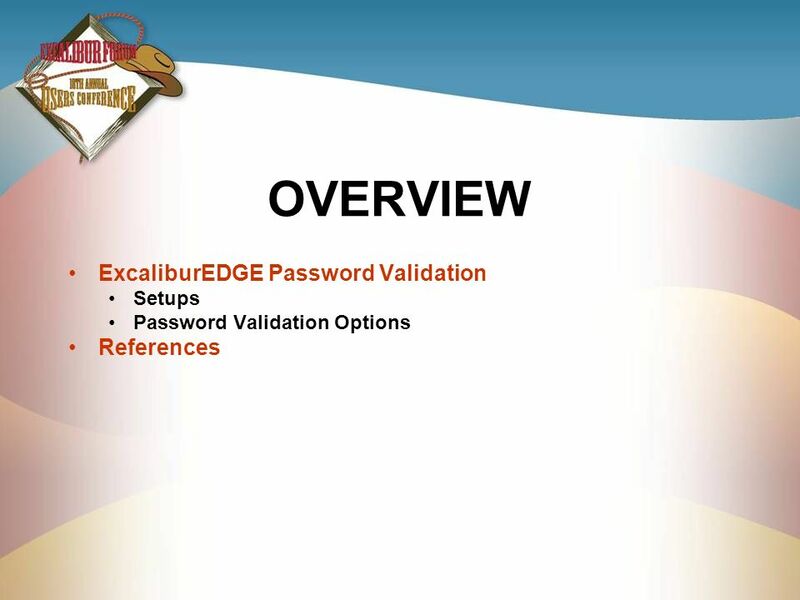 This is the user security setup screen that shows a password, but it is encrypted. 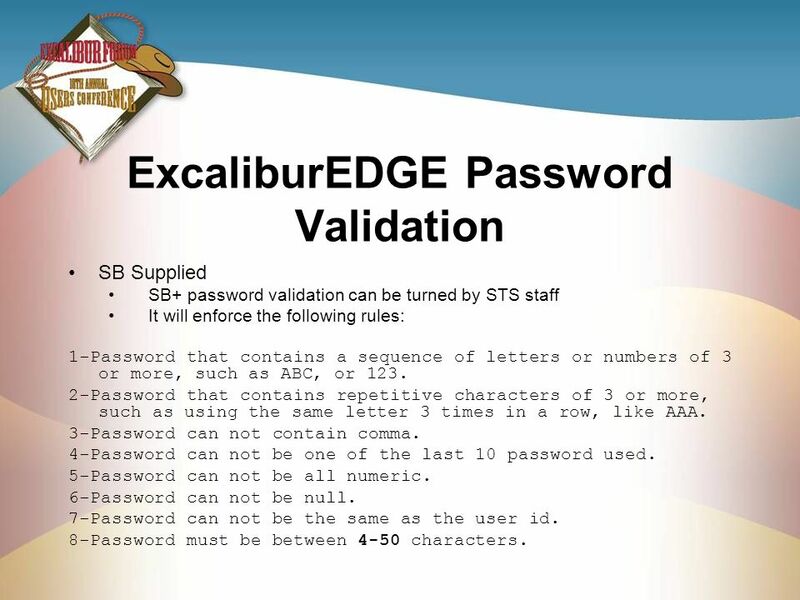 SB Supplied SB+ password validation can be turned by STS staff It will enforce the following rules: 1-Password that contains a sequence of letters or numbers of 3 or more, such as ABC, or 123. 2-Password that contains repetitive characters of 3 or more, such as using the same letter 3 times in a row, like AAA. 3-Password can not contain comma. 4-Password can not be one of the last 10 password used. 5-Password can not be all numeric. 6-Password can not be null. 7-Password can not be the same as the user id. 8-Password must be between 4-50 characters. 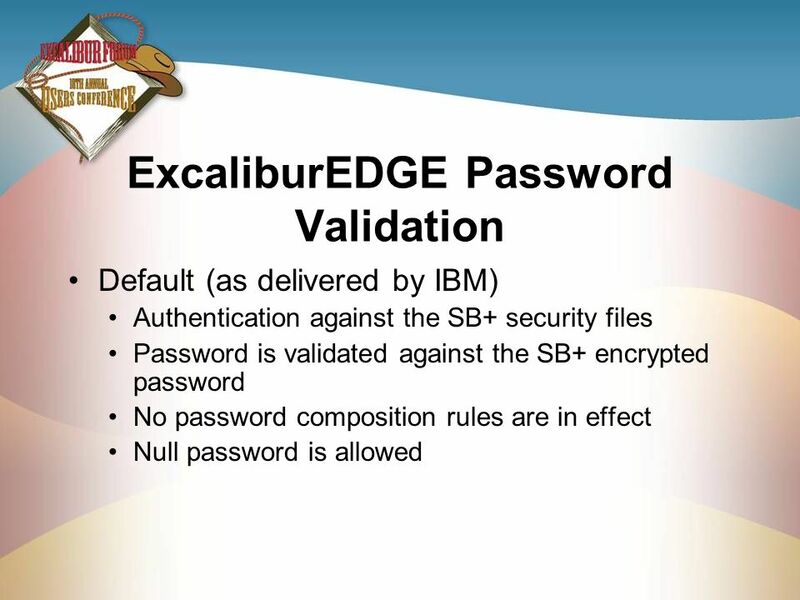 What if you don’t like the lack of password controls supplied by SB+? IBM has supplied a means of implementing a set of 8 predetermined rules that will be enforced. Go over the list. All but the last would be acceptable to IT auditors. 4 character passwords might not be acceptable. 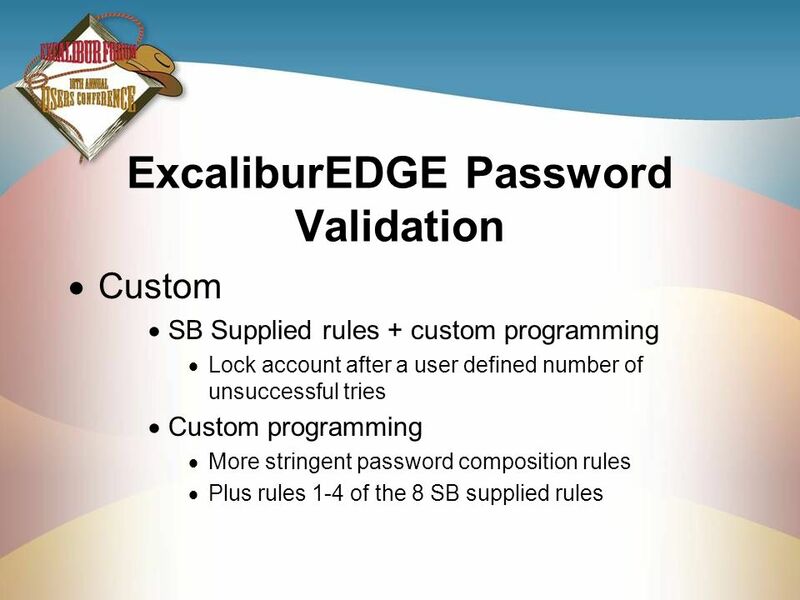 Custom SB Supplied rules + custom programming Lock account after a user defined number of unsuccessful tries Custom programming More stringent password composition rules Plus rules 1-4 of the 8 SB supplied rules What if you or your auditors want more than the 8 rules? IBM has supplied hooks into the system that allow for custom programming to define and implement user defined rules. Rules 1-4 of the SB+ supplied are retained, and then all of the user specified/designed/programmed rules are checked. If you need something more that the 8 rules, lets talk later. 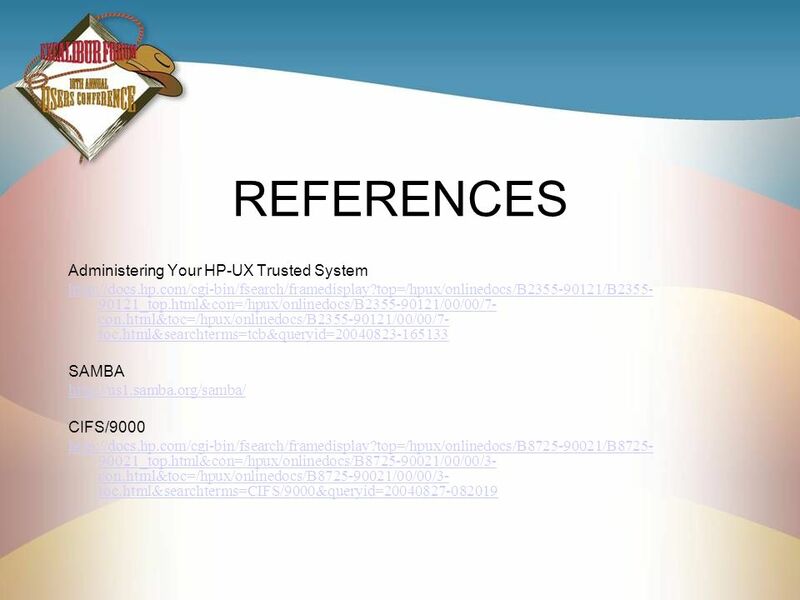 SAMBA CIFS/9000 Here are the references to TCB, SAMBA, CIFS/9000 Thanks for coming. Please fill out your evaluations of this forum. Download ppt "Welcome Hope you are having a good time." © 2004 Hewlett-Packard Development Company, L.P. The information contained herein is subject to change without notice Installation & management of SUSE. Chapter 11: The X Window System Guide To UNIX Using Linux Third Edition. © Ericsson Interception Management Systems, 2000 CELLNET Drop Administering IMS Database Module Objectives To add a network elements to the database. 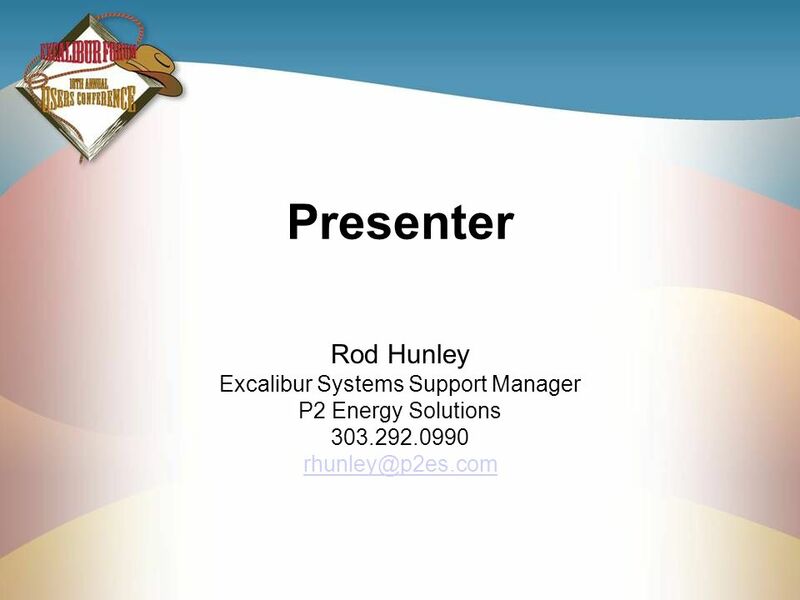 PLANNING A MICROSOFT EXCHANGE SERVER 2003 INFRASTRUCTURE Chapter 2.